This popular broccoli salad is always a hit, and it's surprisingly easy to fix. All you need is some cooked bacon, fresh broccoli, and a few other ingredients. The salad ingredients can easily be adjusted to suit your taste. Some typical additions include sunflower seeds, pecans, or walnuts, and julienned carrots or sweet red bell pepper can be added for color. Bake or fry the bacon until somewhat crisp. Drain on paper towels and then dice or crumble. Separate the broccoli crowns into small florets and put in a large bowl. Add the chopped red onion, raisins, and bacon to the broccoli and toss to mix. Combine the mayonnaise, vinegar, and sugar in a small bowl. Add to the broccoli mixture. Toss to coat the broccoli with the dressing. 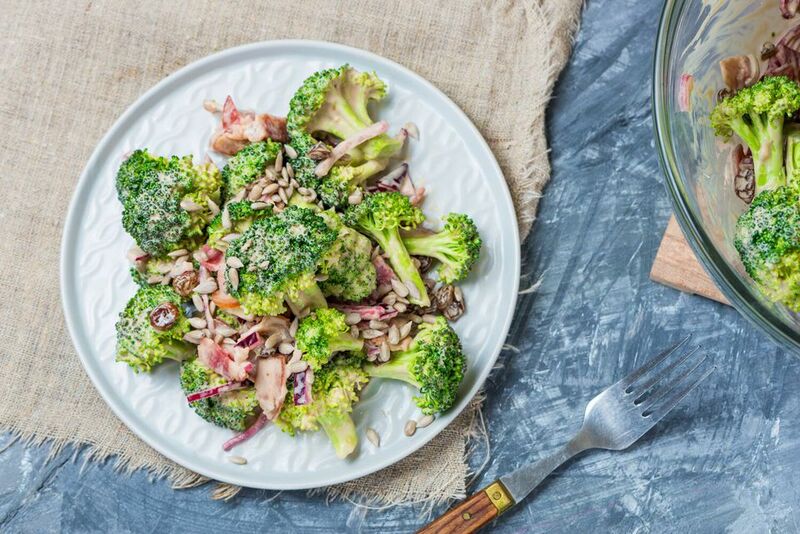 Diced, pre-cooked bacon is an excellent time-saver for this broccoli salad recipe. Take a look at the tips and variations for possible additions and substitutions. For less mess and easier cleanup, try baking the bacon. Line a rimmed baking sheet with foil and arrange the bacon in the pan. Bake in a preheated 375 F oven for about 20 to 25 minutes, or until browned and crisp. Diced, pre-cooked bacon is an excellent time-saver for this broccoli salad recipe. Add about 1/2 cup of julienned carrots to the salad to give the broccoli salad color and additional nutritional value. Sunflower seeds or toasted pecans or walnuts can add flavor and crunch. Balsamic vinegar is sweeter than other kinds of vinegar. Substitute cider vinegar or red wine vinegar plus 1 extra teaspoon of sugar.